This butterfly is standing on a large daisy. 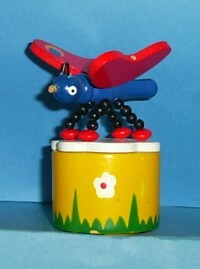 Its red wings have been painted with large yellow, blue and green spots - one at each corner and he has small antennae. The base has been decorated with small daisies too. Still wear to the large daisy the Butterfly is standing on and also a tiny nick of paint mising from bottom edge of stand.